My apple trees have been crazy with fruit. My sugar pumpkins are in peak sugariness. Thanksgiving is breathing down my throat and I'm convinced I can use all my extra farm foodstuffs and cram them into one cake for the occassion. And I did! And it's DELICIOUS! I rounded out the dessert by shoving a few chocolate pastry cream filled cream puffs inside my apple cider/pumpkin Bavarian mousse, sandwiched it all with moist apple cider cake and topped the whole shebang with fluffy whipped cream and MORE caramel coated cream puffs. This is actually a thing in Germany. It's a cake called a Windbeuteltorte (translation: windbag cake). I KNOW! To learn so much more about making cream puffs, eclairs and all manner of beautiful French choux goodness, you can take my Craftsy class and learn all my tips and tricks in the comfort of your very own home! Here's a super duper link that will get you $20 dollars off the class: LINK! In a saucepan, combine the water, milk, butter, sugar and salt. Allow the sugar and butter to melt over low heat. Once melted, bring the mixture to a fast simmer, take from the heat, and add the flour all at once and stir until the mixture is smooth and there are no more flour lumps (this mixture is called a panade). Put the mixture back on the stove over medium heat and stir until a starch film coats the bottom of the pan. Transfer the mixture to the bowl of a stand mixer fitted with the paddle attachment. Allow the panade to cool by mixing for 2-3 minutes. Whisk together 3 of the eggs and add to the mixer while it's running on medium speed. Mix until the eggs are fully incorporated and add the remaining eggs, one at a time, until a smooth shiny paste results. Whisk the eggs before adding. Pipe small rounds onto a parchment lined sheet pan and bake until the puffs are deeply brown and and puffed, about 25-30 minutes. Allow to cool completely. Once cool, poke a small hole at the bottom of each puff. Fill a small pastry bag fitted with a medium-small open tip with the chocolate pastry cream. Fill the puffs with the chocolate pastry cream and set aside in the refrigerator until ready to assemble. In a saucepan, bring the heavy cream and milk to a simmer. In the meantime, combine the sugar, cornstarch, yolks and salt in the bowl of a stand mixer fitted with the whisk attachment. Add the simmering cream/milk in a steady stream with the mixer running. When everything is well combined, return the mixture back to the saucepan and whisk over medium-low heat constantly until the mixture thickens to the consistency of mayo. Take from the heat and add the chocolate. Whisk until the chocolate is completely melted. Transfer to a bowl and cover with plastic wrap, making sure the plastic wrap touches the pastry cream so a skin doesn't form. Preheat oven to 350ºF conventional. Line two 9” cake pans with parchment and spray with non-stick cooking spray. Set aside. Cream together the butter and brown sugar until light and fluffy. Scrape down the sides of the bowl. Add the egg and mix until combined. Add the vanilla bean paste and mix to just combine. In a bowl, whisk together the flour, baking powder, salt and spices to combine. Add half the flour mixture, mix to just combine. Add the apple sauce, mix and then the remaining flour. Mix until a smooth batter forms. Divide the batter evenly among the 2 pans and bake for 15 – 20 minutes or until the cake just springs back when gently poked. Allow to cool completely. In a stand mixer, whisk together half of the pumpkin puree and 1 cup heavy cream until stiff peaks form. Set aside in a bowl in the refrigerator. In the same mixing bowl, combine the remaining pumpkin puree, yolks, brown sugar, cornstarch, cinnamon, nutmegs, cloves, salt and vanilla bean paste. Whisk until smooth. In a small bowl, pour in ¼ cup cool water and sprinkle the gelatin evenly over the water. Allow to sit until it looks like wet sand. Set aside. In a small saucepan, bring the remaining 1 cup heavy cream and apple cider to a simmer. With the mixer running, slowly add the simmering milk/cream mixture to the beating egg yolk mixture. Continue mixing until combined. Transfer the mixture back to the saucepan and whisk over medium heat until thickened to the consistency of very thick mayonnaise. Immediately stir in the gelatin and continue stirring until the gelatin melts completely. Allow to cool, about 1 hour and then fold in the reserve pumpkin/whipped cream mixture. To assemble: Slice an apple into thin "rounds", brushing each with lemon juice. Line a 8" or 9" cake ring with the apples (you can also use a springform). Pour the Bavarian cream into the cake ring, atop the first layer of cake and the carefully place filled cream puffs inside the mousse filling so that they're completely submerged in luscious pumpkin cream, leaving about 6-7 puffs to place on top of the cake. Place the 2nd cake layer atop the mousse and freeze to set. About 2 hours. Whisk the cream and confectioner's sugar together until stiff peaks form. Pipe atop the cake. In a saucepan, stir together all the caramel ingredients until the sugar has melted. Take a pastry brush and wipe down the sides of the pan with a moistened pastry brush to knock down any clinging sugar granules. Once all the sugar has melted, stop stirring. When the caramel is light amber, take it from the heat and place the saucepan in a shallow pan of ice. Dip the remaining filled choux puffs in the caramel and set on a parchment lined sheet pan until the caramel sets, about 5 minutes. 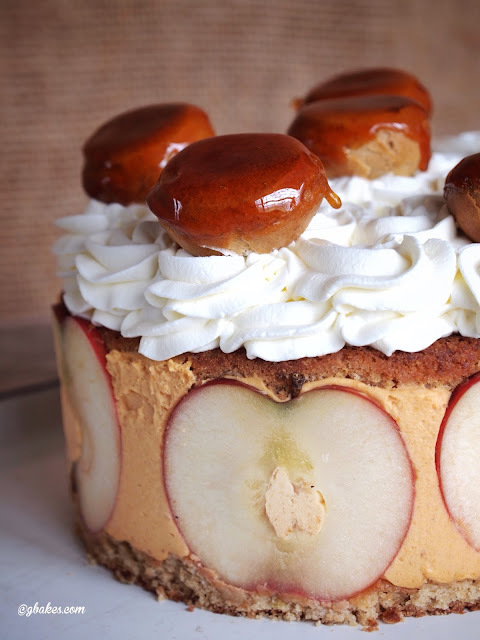 Top the cake with the caramel coated puffs.